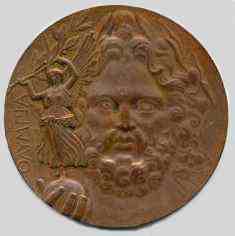 Laureated head of Zeus facing and holding winged Victory with laurel branch on globe. 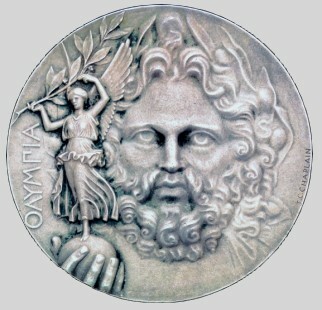 To the winner a silver medal was given, to the second winner a bronze medal. 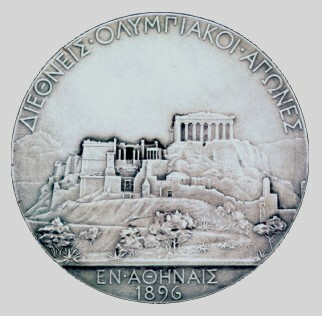 There was no gold medal in 1896! And no medal for the third place winner. 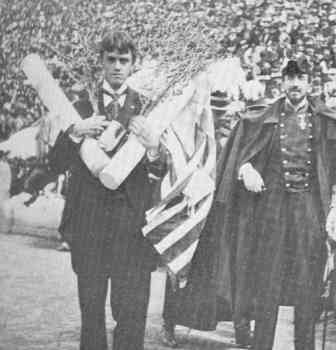 As soon as the King had taken his seat Mr Robertson, from Oxford University advanced towards him, and read an ode which he had composed for the occasion to celebrate the glory of the Olympic Games. In this ode written in Ancient Greek in Pindarian meter, the poet gave vent to the most noble sentiments, which only an ardent love and knowledge of Ancient Greece could have inspired him. The King lent a most attentive ear to the recital of those beautiful verses, and the audience cheered heartily when the poet had finished speaking. After having warmly congratulated Mr Robertson the King stepped on a sort of platform, erected before the Royal seats, and richly decorated with carpets and flags. On a small table were placed the olivebranches, to remind one of the ancient Altis, some laurel branches and the different diplomas, written on blue or white paper and folded up in long rolls. 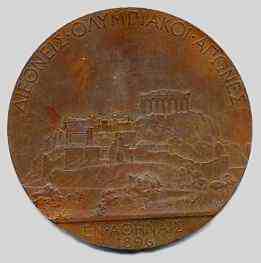 The medals, struck in silver for the first, and in bronze for the second prizes, were real masterpieces of workmanship; the model being engraved by the celebrated artist Chaplain. After each call the winner mounted the stand and bowing before the King, who had a few kind words to say to everyone, received the diploma, the prizemedal and the olive branch. The King shook hands with each winner, who after a respectful bow retired to make room for the next champion. Each competitor received of course an ovation from the assembled crowd.